PHOENIX (AP) ai??i?? Arizona Gov. Jan Brewer has vetoed a bill that would have increased the amount businesses that buy new machinery or equipment could deduct from their taxes from $25,000 to $500,000. 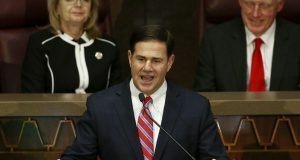 The Republican governor said in a veto letter Wednesday that House Bill 2664 would have permanently put into Arizona law one provision of federal tax law and would cost the state $25 million in 2015 alone. Brewer says that money is needed to fund an overhaul of the state’s child welfare agency. The bill by Republican Rep. J.D. Mesnard of Chandler also would have indexed tax brackets for inflation, preventing a small income rise from putting a taxpayer in a higher bracket. It also made several other tax law changes.